Growing up nestled in the foothills of the San Gabriels, in the small town of Sierra Madre left an indelible impression on Gwendolyn, an artist inspired by the hidden treasures of nature and spirit. Now living in the busy neighborhood of Silver Lake, California, Bright Light is an homage to the thriving alt-country music scene in Los Angeles and a reflection of her journey through love, marriage and motherhood - a growth that reveals a yearning for a simpler time and a need to get back to living a “country” life. Ethan Allen (Patty Griffin) produced Bright Light over the course of three weeks. Gwendolyn and her long-time band mates Brandon Jay (drummer & found percussionist), Robert Peterson (bassist), Douglas Lee (glass harmonicist—26 different shaped wine glasses harmonically tuned) were joined by Los Angeles music stalwarts, Josh Grange (Dwight Yoakum, K.D. Lange) Tony Gilkyson (X, Lone Justice), Paul Lacques (I See Hawks in LA) with Evo Bluestein, Cliff Wagner and Tim Weed rounding out the material. You will also hear members of I See Hawks in LA and The Living Sisters filling out harmonies. The record starts out with the song “Discover Me” encouraging meditation amidst the chaos of everyday life. The second song “Bright Light” contemplates mortality whilst recognizing the infinite light within you and others around you. “Durango” laments about experiencing a landmark moment in the absence of a loved one and trying to reach them over the length of a desert. Frustrated and confused about her path in life, “Plants” was written after a phone call with her father. Her dad advised she “be like the plants” - just be who she is for better or worse and enjoy life for life’s sake. 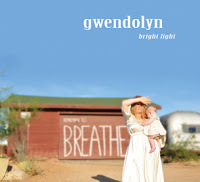 The last song on the album, “Let the Light” reveals Gwendolyn’s own struggle to live in the moment, be kind and forgiving to herself and others, appreciating life’s many gifts and allowing them to come forth. The music of Gwendolyn has been described as unearthly, unexpected, poignant and enchanting. Prior to Bright Light, she released 3 different albums. Her first in 2000 called Ultrasounds was an exploratory album of demos she had been collecting - one of which was the song “Freedom Of The Heart (Ooodily, Ooodily)” that she wrote for the film, Chuck and Buck. In 2003 she released Dew, a folk-rock record capturing her band’s unique sound and featuring musical veterans Smokey Hormel (Beck, Norah Jones) and Ralph Carney (Tom Waits). Next came Lower Mill Road, released in 2007 and produced by her mentor Ben Vaughn (Ween’s 12 Golden Country Greats) who flew her to Scotland to create a more traditional sounding folk album backed by local musicians. The 13 song recording of Bright Light still earns Gwendolyn’s trademark of pushing the boundaries of unexpected time changes and ordinary song structure, and presenting life seen through her polychromatic lens, but this time the songs have a little more lilt and twang. A woman of many hats, Gwendolyn has also recorded 4 albums of children’s music as Gwendolyn and the Good Time Gang. She serves as composer for Showtime’s hit comedy Weeds, and also is in the process of writing a Broadway musical based on the film, Romy And Michele’s High School Reunion. Country music is a category that also defies definition these days ranging from music coming out of modern Nashville to old school country Nashville, red dirt music of Oklahoma, Bakersfield honky-tonk to the new monikers of alt-country and Americana. Country music at its heart is the Universal human element known as singing the truth. Gwendolyn sings about her perception of the world, the human condition and having faith in your own beliefs. There is nothing more truthful than that.